For the last decade Bayliner’s bread-and-butter boat has been the 175 Bowrider – a classic and well-designed runabout at a good price. That all started to change in January 2013. That’s when Bayliner introduced the Element, a 16-foot runabout with their patent pending M-hull that increases stability by about 30 percent versus traditional hulls. It was an immediate hit and the boat builder with more than half-a-century of experience quickly realized they had hit the nail right on the head. Capitalizing on that momentum, they stretched the hull by two feet and launched the Element XL. Then, they wondered where to go next. Getting into the still growing pontoon market seemed like a no-brainer and someone at Bayliner HQ pointed out the M-Hull already looks like a triple-pontoon. Its wide footprint meant stability and had the bonus of proven high performance like traditional V-hulls. So instead of reinventing the wheel they just stretched theirs once again and created their “pontoon alternative,” the Element XR7. At 25.5 feet long and 8.5 feet wide it certainly is roomy, with configurations you would expect on a pontoon. Then it’s closer to a deck boat by design, but looks like nothing you’ve seen before. This is its own beast. So it’s big, and because it’s a fibreglass hull and not aluminum logs, it’s heavier than most pontoons but you wouldn’t know it when you hit the throttle. Rated for a maximum of 200 horsepower, we tested it with a 150hp Mercury and it did not feel in any way underpowered. You can cruise comfortably anywhere between the low 20s to low 30s depending on your load and the conditions you’re in. My first thought when I sat in the helm seat of the XR7 was, “Wow this is really high up.” The more I drove it the more I loved it and wished more boats did it that way. The line of sight is exceptional, especially over the front bench seats. Plus it’s a downright comfy chair too. When we were doing the test shoot I tried to keep it around 25-26 miles per hour for the sake of our cameraman on a chase boat and found that was as smooth and solid as when I punched the throttle right down. With the 150 hp outboard opened right up, top speed is just shy of 40 miles per hour dancing around the 38-39 mph mark which, admittedly, isn’t going to get the speed demons all fired up, but that’s not the point of this family-friendly, yet peppy day boat. And the M-hull helps pop you up to 20 mph in less than six seconds and to 30 mph in less than10. But feel is more important than stats and this is a very comfortable boat to drive. 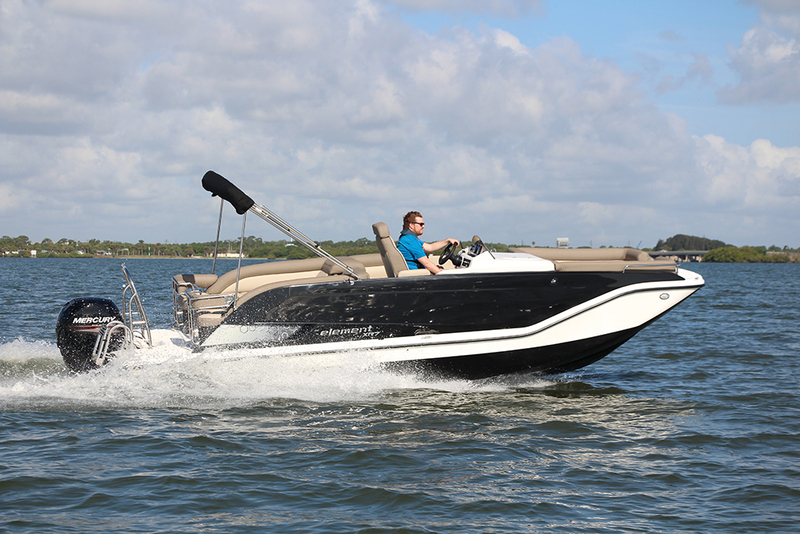 The XR7 is easy to handle, cornering nicely, and cruising confidently even in the choppy-at-times Florida Intracoastal. And because of the high bow platform, when compared to most deck boats, it’s a dry ride even when you’re crossing the wake of a 50-foot cruiser. When you’re done playing around on the throttle, you have plenty to enjoy at the dock with a mix of expected features and some unique ones thrown in for good measure. 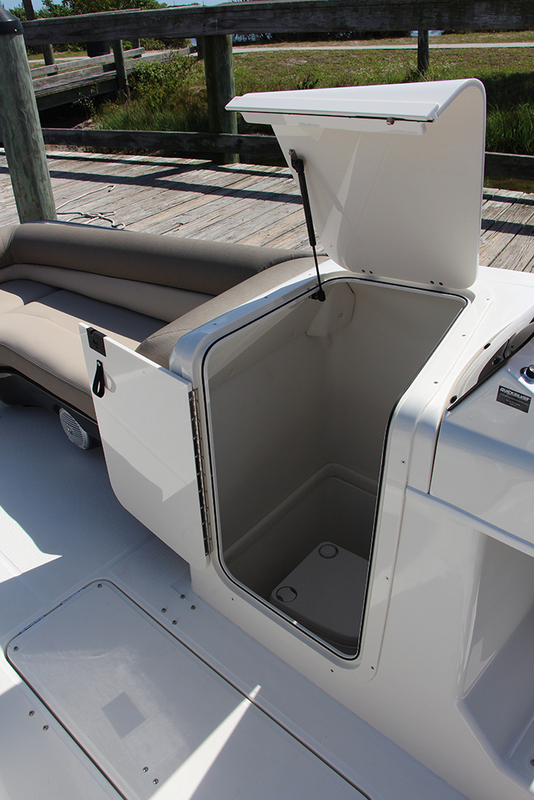 Like any pontoon, large bench seats flank the bow and stern, all with storage underneath. The benches at the stern having a rear facing design for lounging to highlight the swim platform and ski tow pole. The helm, with its raised platform, is clean and straightforward with just a handful of switches and gauges. And opposite is a small refreshment centre with sink and optional fridge. I keep mentioning the M-hull because it keeps proving useful – even when at the dock or on the hook. Not only does it provide stability but it also means plenty of room for storage. The XR7 has multiple massive, in-floor ski lockers. 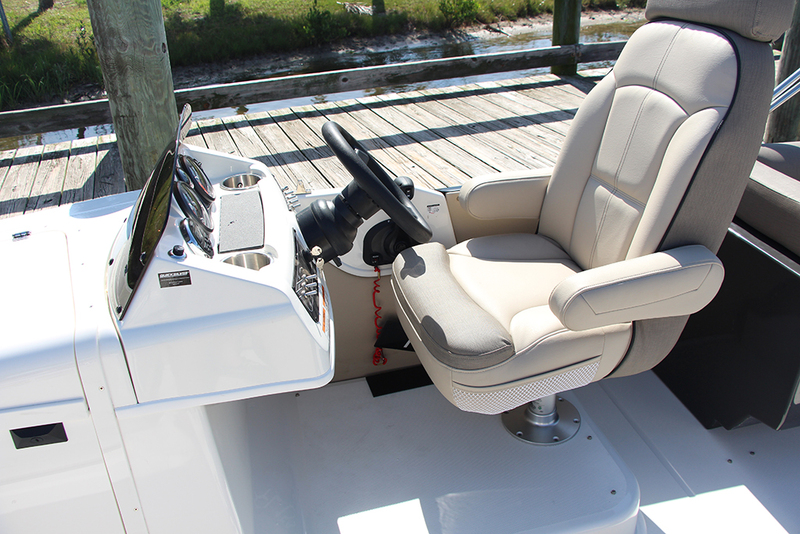 Attached to the helm console, just in front of the controls, is a huge storage compartment that doubles as a roomy head, not the canvas privacy enclosures you’ll find on traditional pontoons. 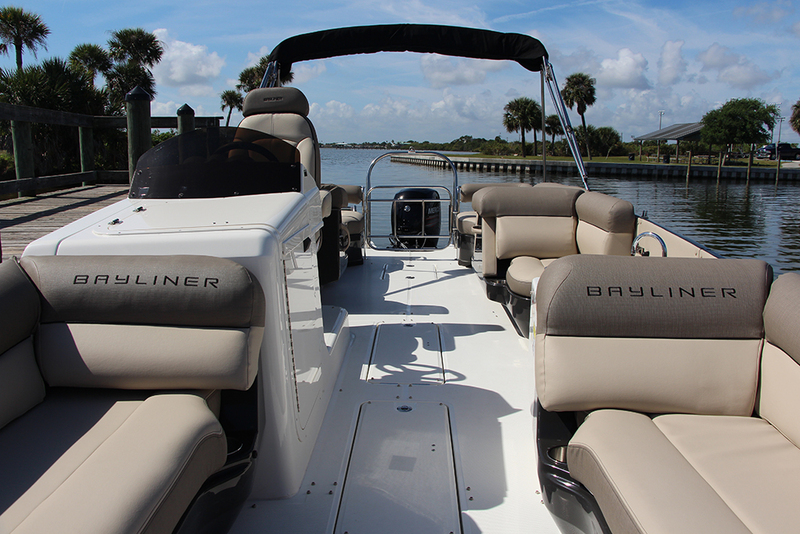 The Bayliner team admittedly took a risk by stretching their 16-foot runabout hull out to create something so unique looking that attempts to get a piece of the pontoon pie, but it paid off. Now to see if consumers will buy in.